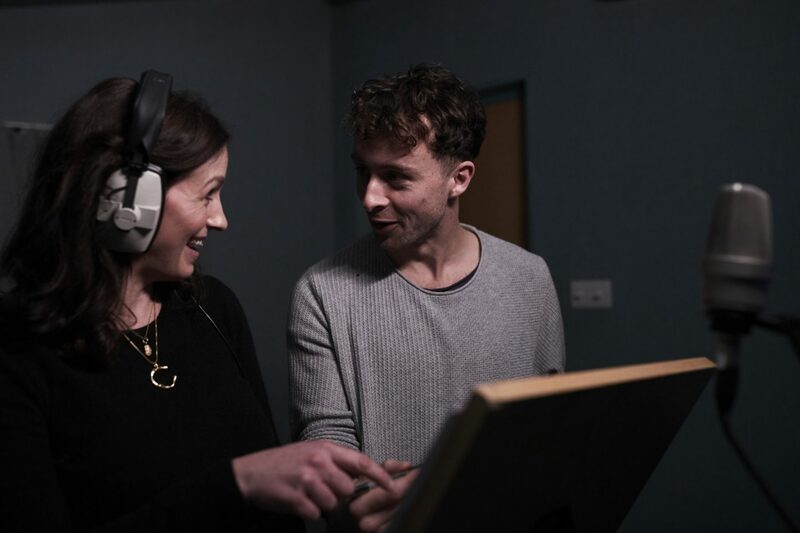 Last month I spent the day in Edinburgh with LNER at Canongate Studios, where they were recording (and filming) a number of people reading a poem written by Ben Norris in collaboration with Edith Bowman, called Track Record. The poem came about as part of LNER’s campaign to celebrate regional accents, particularly those from the towns and cities located along the train company’s London to Aberdeen route. Of course, being based in Dundee I was there to read the Scottish lines, and there were many other people in attendance at different stages to record the poem in their own accents. Even though I was nervous, by the end of my session I felt more relaxed, and ended up thoroughly enjoying the experience. So, what did my first time in a recording studio involve? I thought it would be simplest to lay it out from start to finish. My sat nav gets me to Leith without any hiccups and I even find a parking space right outside Canongate Studios. I’m early, so I freshen up my concealer (Kits is still up in the night) and go for a short walk around the block. I take some selfies on my Samsung S9 (can you believe I just found the self-timer during the Christmas holidays?) so that I can share my day (and coat) on Instagram. I find the studio door quickly and buzz to be let in. A man directs me upstairs and I’m surprised to be met by a make up artist, who sits me down and gets to work. I’m still self-conscious about my braces so I insist on no lipstick – as with most MUAs, she ignores me (well, she does know best) and applies a colour the same as my lips with a touch of gloss, explaining that the camera needs it, going on to cover up my dark circles (jeez, they must be bad) and apply some more eye makeup. It’s a relief when I go to the bathroom and like what I see – I look like me, but less tired and a touch more glamorous. With hair and makeup done, I wait for my turn to be called. Two more women appear and we chat while they have their hair and makeup done too. Lunch is offered, but I decline as I’m trying hard to be good in an effort to shift some baby weight (I have a snack waiting in the car). We chat more, and I discover the make up artist works with celebrities and also styles for theatre and TV. I’m called to the studio and see lots of people – PRs from the London agency, a camera man, a photographer, a producer, and Ben, who runs through Track Record with me. He explains the rhythm, the slang words, the feel. 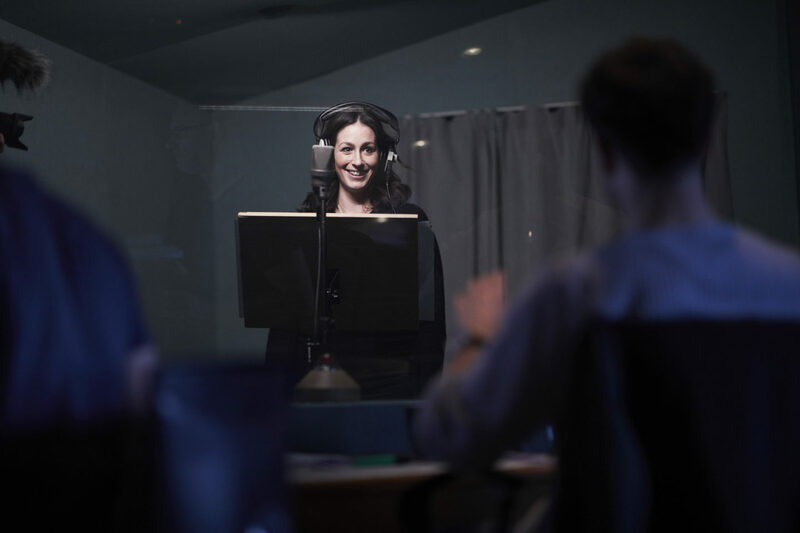 I’m shown into the recording room and feel taken aback at the mic, the headphones, and the massive window through which I can see the room – and all those faces – I just left. We’re halfway through the session and I’m getting into it. The headphones, the mic, I feel like I should be part of Band Aid! I just don’t sound like them… Thankfully, Ben’s direction is great – he quotes the line I’m to read, giving me an idea of what he expects, and tells me to keep that in mind as I read it in my own way. I do what feels natural for me, but his encouragement is good and helps me to relax and ‘perform’ despite the heavy duty cameras and all those people. My work is done! I’m disappointed it’s over but Ben seems happy with my contribution and lines, so I’m glad to have managed to deliver what was needed. We have some photos taken in the studio and enjoy reading the full poem aloud to each other. I thank Ben, the people around, and the PR agency and say my goodbyes. There’s a cafe across from my parking space so I pop in for a cappuccino for the drive home. It should be decaf but I know the next shift (the home shift) will start as soon as I’m in the door, so I go with fully caffeinated. I arrive home after another gorgeous drive. I can’t wait to share my experience in a studio celebrating local accents. This is a sponsored post in collaboration with LNER. Thought that was fun! Brought back memories of different accents I am familiar with. Well done. Wow what a fabulous day out and experience. Well done you. I felt exhausted just reading it. Beautifully written account of a happy exciting day out.